Sweet Biscornu [C6477] - $9.98 : Yarn Tree, Your wholesale source for cross stitch supplies. 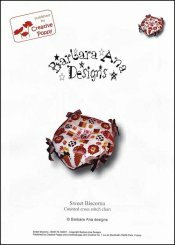 Cross stitch pattern by Barbara Ana Designs. Colorful sweet treats; ice cream cones, candies, and cakes. Stitch count 76 wide x 76 high. Stitched on 6 ct White Aida.